THE STRONGEST ALL IN ONE PRODUCTIVITY NOOTROPIC ON THE MARKET. Designed to increase focus, energy, and crush any rises in stress, anxiety, and depression in its tracks without a crash or a tolerance build-up with just 1-3 capsules a day. No extra products required. No caffeine. No jitters. No withdrawals. No headaches. INGREDIENTS UP TO 5-10X OF COMPETITION. No proprietary blend. Fully compliant, fully-disclosed label. Compare our label to Alpha Brain, NeuroPeak or Ciltep and we crush them all day, every day. As seen on The Street, Market Insider, Business Insider, PricePlow, Fox29, NBC, ABC, Canadian Business Tribune, Morning Star, and more. .
INFUSED WITH CORTISOL BLOCKERS AND ADAPTOGENS. Restore your adrenal glands after years of caffeine abuse, reduce stress, anxiety, and depression for good. 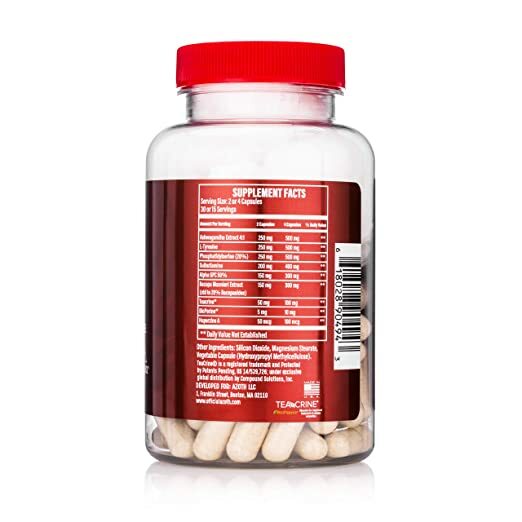 - 500mg of Ashwagandha Extract: Ashwagandha is an adaptogen, it helps to deal with stress, reduces cortisol, helps with anxiety, improves performance, helps to deal with depression, reduces perception of fatigue and plenty of other benefits. It's the minimum effective dose you want to see so it's alright. 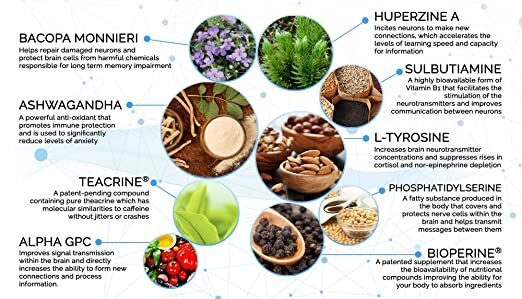 - 500mg of L-Tyrosine: From NOW L-Tyrosine's product: "L-Tyrosine is an essential amino acid and a precursor of the neurotransmitters dopamine, norepinephrine to help maintain normal and health mental functions and support your mood or well-being. In addition L-Tyrosine may also support healthy adrenal, thyroid and pituitary function. One thing it also does is convert to the thyroid hormone thyroxin. This plays an important role in controlling metabolic rate, not to mention skin health, mental health, and growth rate!" It's the minimum effective dose you want to see so it's alright. - 500mg of Phosphatidylserine: From SR: "Fat-soluble amino acid derivative found in the brain that can improve memory and cognitive function and reduce stress when supplemented." More info read here: https://supplementreviews.com/ingredients/phosphatidylserine SR says the clinical dose is 300mg and this has 300mg so excellent job! - 400mg of Sulbutiamine: From SR:"Fat-soluble form of Vitamin B1 (thiamine) that combats fatigue, improves memory, preserves brain function, and exhibit stimulative and ergogenic properties." The studies use this dose so good job. - 300mg of Alpha-GPC: From Examine: "is a cholinergic compound that is used for its cognitive-promoting properties, and to enhance power output in athletes. It appears to also support cellular membranes, and may aid in preventing cognitive decline." 300mg is an acceptable dose, it could be higher though but it doesn't fall into the underdosed category. For the cognitive decline prevention, a much higher dose is required (more than 1g). But no problem, I don't expect full clinical dose on all ingredients, what's the fun of that? - 100mg of Theacrine (as Teacrine - patented form): I'm not a fan of this ingredient in Pre-Workout supplements because I think the doses included are too low and ridiculous. However, in this case, I agree with the dose used because this is a different category of supplement. From Examine: "There may be stress reducing properties with low doses of theacrine." It talks about other areas but it says they used TheaTrim. 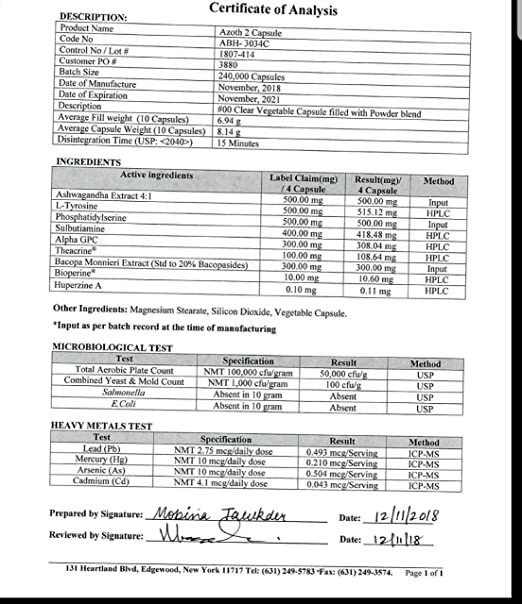 From Examine: "TheaTrim is a proprietary blend of theacrine (amount unspecified due to its proprietary nature), 150 mg caffeine, white willow bark, S-Adenosyl Methionine, Rauwolfia vomitoria extract, citrus bioflavonoid complex, and vitamin B12." So some of the studies in the focus area in which Theacrine is involved, use TheaTrim so the positive effects on Focus of the studies can't be attributed to Theacrine by itself. However, considering Theacrine is very similar to Caffeine, I still see a lot of potential of Theacrine in that area so good job including it. I think the dose is fine for Focus effects. - 10mg of Bioperine for increased absorption although I don't know if the studies of Bioperine have tested the ingredient with one or some of the other ingredients in this formula. - 100mcg of Huperzine A: From Examine: "It is known as an acetylcholinesterase inhibitor, which means that it stops an enzyme from breaking down acetylcholine which results in increases in acetylcholine." Remember Alpha GPC above? Well, Huperzine A is going to work well with that ingredient, cool. Doses go from 50 to 200mcg, this has 100mcg so it's good. Size: 45 capsules, 100% vegetarian capsules normal size. Timing: They suggest to take 2-3 capsules with a light meal containing healthy fats and to not exceed this recommended dosage. I would suggest to obviously take this whenever you're going to do an activity that requires the benefits of the ingredients. I wouldn't take this to watch TV for example.. (you get the point). This product is the gospel truth! As a nurse strung out on caffeine, suffering from ADD, and PTSD as a result of life and night shifts, my adrenals are shot. Prescription meds only go so far when your body is exhausted, so I've relied heavily on good nutrition to start healing. I was still having a hard time focusing long enough to get everything done for life and work, and after a lot of research came across Azoth. I loved that it has no caffeine because I've been trying to cut down/quit with no success. After a week with Azoth I'm down to less than 100mg's a day, and I was on 2-300mg a day! I'm starting to feel like my younger, happier self. I have the focus I need to get more than enough done and on time, while not having melt downs from caffeine crashes. The mix of noortropics and Ashwaganda feel supportive and healing to my system rather than leaving me a nervous wreck. I'm ordering another bottle already so I have it, this is one of the best things I've ever taken and I've taken a lot of stuff, trust me! I've gotten more "sh*t" done this past week then I have this whole month!!!!! Wow, so happy I found this product. I've been struggling with ADD/ADHD most of my life, and have always tried to stay away from prescriptions. Over the past few years I have been dabbling in the supplement and nootropic world a bit. I have tried both grey market standalone nootropics, as well as those natural nootropic blends like CILTEP, Alpha Brain, etc. Most of the blends I've tried are underdosed and ineffective. And all those grey market nootropics that I have tried that actually work are only found on sketchy websites that you can't always trust. This is the first all natural blend I have tried that is actually more than just a placebo. This knocks Alpha Brain right out of the park! I would recommend this to anyone who needs a nice boost in attention and focus. 5.0 out of 5 starsLaser-focused attention to detail! This is a superb blend of nootropics that delivers clear focus and energy. I feel I am able to accomplish much more in a given workday long before my usual lunch break at noon. I've been really enjoying the two bottles I ordered a couple weeks ago and I'm probably going to order more. I have one bottle at home and one at my office. I feel very focused throughout the day and my job requires me to work 50-55hrs/week. I experience absolutely no crash an no jitters. For me, it is just pure, focused clarity and mental stamina. I feel as if I am able to serve my clients better since my thoughts and communication seem to have a much greater fluidity. Thank you! 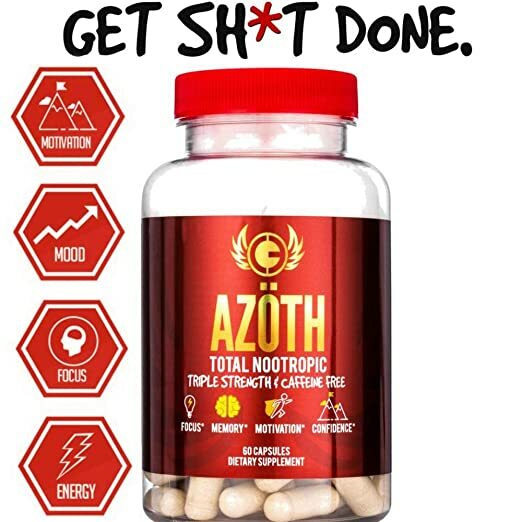 Click the button below to add the AZOTH Super Nootropic (No Caffeine) - Cognitive Enhancement to your wish list.